For the first time since Moscow transferred the system in October, satellite imagery released Tuesday purportedly shows visible progression in the operational capabilities of Syria’s S-300 air missile defense system. Satellites of Israeli firm ImageSat International (ISI) captured three of the four batteries clearly visible at a military base near the northwestern city Homs. The batteries are deployed in an area that is reportedly home to Iranian manufacturing facilities that produce precision weaponry for Lebanese Hezbollah. Previous images captured by ISI in November revealed a high probability that the system was not yet operational, according to a statement released with the imagery. “None of the missile launchers have been erected and there are not signs of activity,” an updated image of the site provided by the firm revealed. 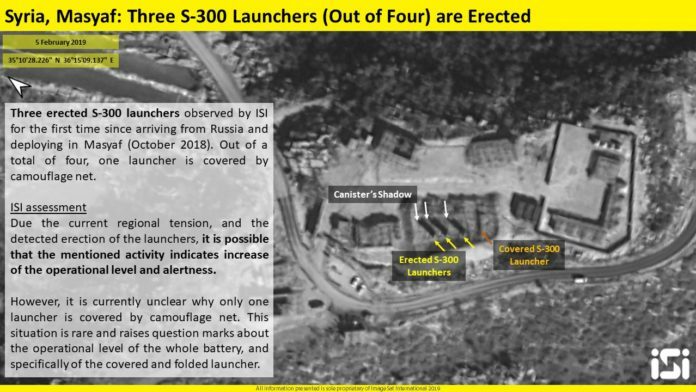 Since 2013, Russia has repeatedly announced that they would transfer the S-300 launchers to Assad. Following each announcement, Israel has put heavy pressure on Russia to abandon the transfers. However, the advanced system finally arrived in Syria at the end of October after Russia announcedit would be supplying the Syrian regime with the technology following the accidental Syrian downing of a Russian plane during an Israeli air strike in Syria, an incident that raised tensions between Israel and Russia. 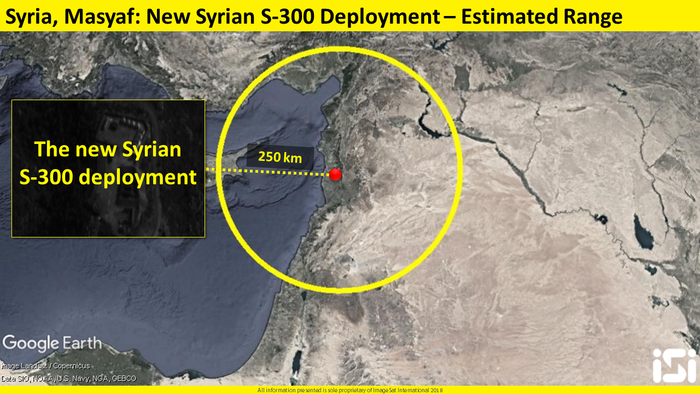 Deemed to be more efficient and advanced than any other interceptor missile system currently in Syrian possession, the S-300 can intercept not only planes but also ballistic missiles with ranges of up to 250 kilometers and at a very high altitude. Operation of the system could make Israeli jets far more vulnerable in any future missions in Syria. Russia, which is backing Syrian President Bashar Al-Assad’s government forces in the country’s civil war, has largely given Israeli warplanes a free hand over Syrian skies turning a blind eye to frequent strikes on Iran-backed forces. Damascus has said that Israel is able to “get away” with violating its sovereignty because of support from the United States. Netanyahu has vowed to intensify Israeli action in the wake of the United States’ withdrawal. On Tuesday, the top general overseeing US military actions in the Middle East said that Trump did not consult him ahead of the decision to pull US troops from Syria. “I was not aware of the specific announcement. Certainly we were aware that he had expressed a desire and intent in the past to depart Syria,” US Central Command head General Joseph Votel, who is retiring in the coming weeks, told the Senate Armed Services Committee. “I was not consulted,” he added.